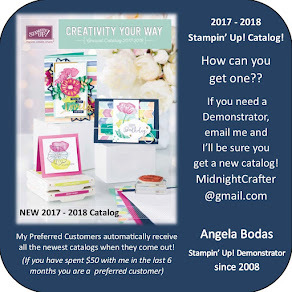 I hope you made time to catch the Stampin' Up! Live Free Class event on Wednesday, there were some great ideas for the spring season! Stampin' Up! presented ideas using the All Wrapped Up Bundle, which is a special bundle for Sale-a-bration (hurry - ends 3/31!!!) but includes items available in our regular catalog. again - loving that cut out design!! These bags make gift giving a snap!! Included in the bundle are three smaller bundles, the Tag A Bag Bundle, the Tag a Box Bundle, and the Tag a Bag Accessory kit. 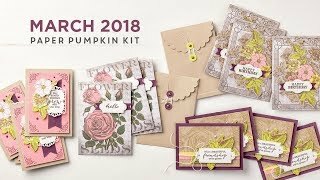 You also get the Oh, Goodie Stamp Set,Gumball Green Classic Stampin’ Pad, Smoky Slate Stampin’ Write Marker,Bermuda Bay 1/8" Taffeta Ribbon,Crushed Curry 3/4" Chevron Ribbon. Quite a coordinated collection,! It really is perfect for spur of the moment gift giving, or for party favors, class treats, Teacher appreciation, care packages for camp, lunchbox surprises, or take it all the way into the holidays: advent calendars - you get the idea! GREAT to have on hand!! People were ooh-ing and ahh-ing over this idea, cutting down the Tag a Box gift boxes to create smaller boxes. The box itself comes as a 6.75"x2"x2"(-ish) box, which is great to hold a dozen little cookies, or pack with treats or small gifts... but its Super Cute as a tiny 2 or 3 or 4" box! Little chocolates or jewelry would be adorably presented in these tiny bits of cuteness. So here is the measuring and cutting instructional video to re-size your boxes, if you want to give it a whirl! The boxes alone are very economical, coming in at $6.95 for 8 food safe boxes with acetate sleeves. Find them and the bags and tags in the Gift Giving section of my online store. If you love the Designer Series Paper used, you should get over to my online store and get your order in - its only available as a Sale-a-bration gift with your $50 purchase! If you purchase the All Wrapped Up Bundle you'll be able to grab the Sweet Sorbet Designer Series Paper as your Sale-a-bration item!! But that offer expires Monday 3/31!! Great items this Sale-a-bration, I hope you got the ones you wanted! Hurry! Sale-a-bration items will be gone with March - that party ends Monday 3/31/14!! !